Since its dedication in 1953, Port Canaveral has evolved into a major deepwater port of entry with first-class berthing facilities, a thriving marine commercial park and Foreign Trade Zone, and successful cruise and cargo industries. The first tankers called on the fledging Port Canaveral in 1955. In the coming years, tourism, the seafood industry, cargo ships, and the space race would drive business and growth to the Port. In 2000 it became the busiest cruise port in the Western Hemisphere. Now the second largest multi-day cruise Port in the world, Port Canaveral proudly holds the distinction of being th first quadramodal port in the world, with links to sea, land, air and space transportation. Port Canaveral is located on the U.S. East Coast within easy cruising distance of the island of Bermuda, the Bahamas and the Caribbean. 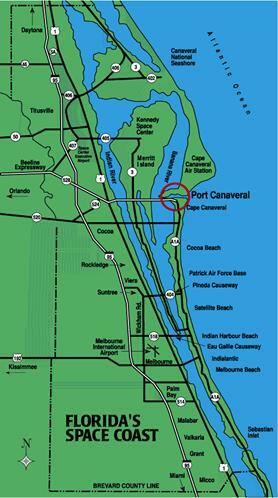 Port Canaveral serves all of Central Florida from its coastal location in Brevard County. It is the closest deep water port to the nearby Orlando-area attractions and neighboring Cape Canaveral Air Force Station, Patrick Air Force Base, Kennedy Space Center and Cocoa Beach.